Google Summer of Code is officially over and it’s good to look back and see what happened during the summer (even if the work is not over yet!!). I will go ahead and do the list-based post which helps me keep things clear. Annotation names are internally unique. The sidebar is refreshed when an annotation is deleted. After deleting all annotations of one page, adding another annotation is recognized. All the previous bug fixes allowed that deletion of annotations is finally pushed to master (https://bugzilla.gnome.org/show_bug.cgi?id=649044). Immediate update of color and opacity (https://bugzilla.gnome.org/show_bug.cgi?id=725571). Fixed warning of annotation properties window (https://bugzilla.gnome.org/show_bug.cgi?id=732114). Non-deterministic color problem of annotation window (https://bugzilla.gnome.org/show_bug.cgi?id=732211). Size of annotation window icons (https://bugzilla.gnome.org/show_bug.cgi?id=735110). You can see that there is a big delay between dragging the cursor and updating the view with the highlight. It is precisely this problem that I am trying to fix at the moment, thus “final”, in quotes, as the title of this post. 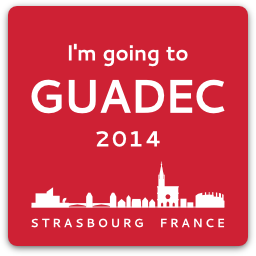 It’s been more than a week since I am back from GUADEC in Strasbourg, and I must say it was an amazing experience! I went there in the middle of a chaotic time: I had just finished my PhD defense, was helping organize a huge logic conference and, because of this conference, had many friends around and even one at my place. This did not leave me much time to think, which was in fact good. Because if I stop to think about it, I was going to this place I did not know, alone, to meet people I met only over the internet. It sounds like something my parents would strongly oppose, if it was 1999. But it was not, and so I went. I wouldn’t like to let that go. I hope to see you all in Sweden next year! I am looking forward to going back working on it, specially because there was some progress before chaos took over and I really want to finish what I have started. I basically used patches from gpoo and Anuj (the other gsoc student working on evince) and implemented text markup annotations (highlight, underline, squiggly and strike out) to evince. Although they implemented free text and line annotations, these depend on some changes to poppler. For text markup, poppler seems to be ready to go, and I guess these are nice annotation that people use more anyway. The days before GUADEC will be evince 24/7 to finish these annotations! I started reading about the PDF file format last week, and I was impressed how much you can do with it. When I think of PDFs, text files immediately come to mind. Of course you can have some forms to fill in (which is quite practical) and pictures, but it is used mostly for text. So what was my surprise when the first chapters of the PDF book I am reading (Developing with PDF by Leonard Rosenthol) were all about paths… In principle, I can draw *anything* in a pdf. Pretty cool, no? I will improve annotations, so I need to know how annotations work. These are embedded in the pdf file itself, and there are 17 possible types. Whenever you are implementing a viewer for pdfs, you need to be able to read these elements and show them on the screen. In the case of evince, poppler is responsible for reading the pdf info, and poppler elements are then translated into evince elements, which are displayed properly. 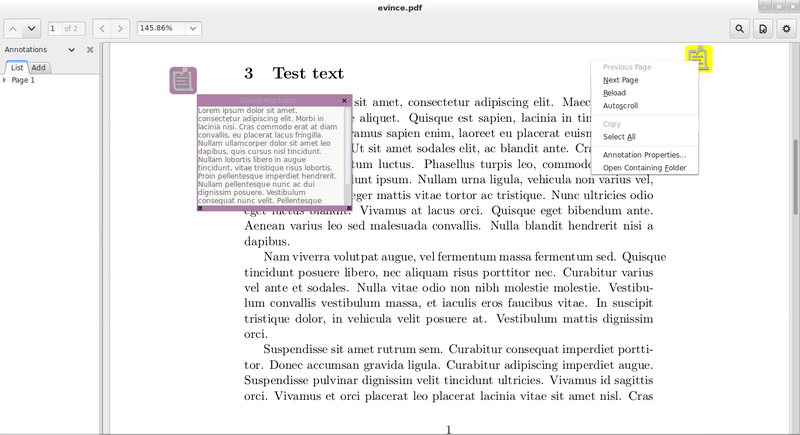 Currently, evince supports 2 annotations (text and file attachment) as annotations themselves and 2 (link and widget) not exactly as annotations internally. 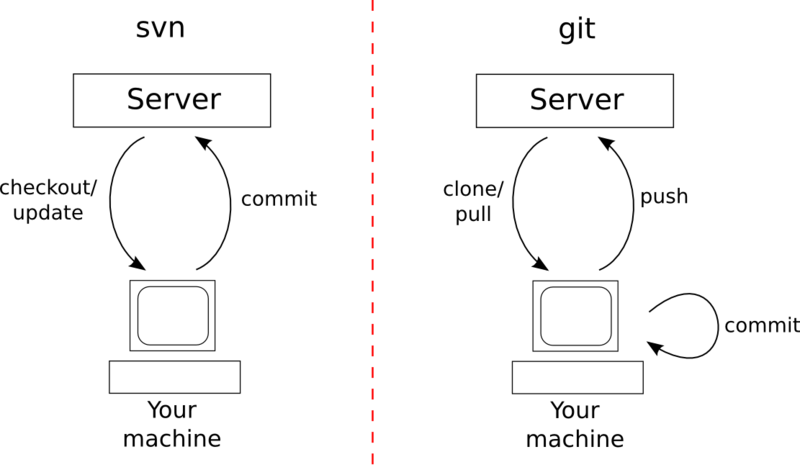 From the supported annotations, the text one presents some problems. The text annotation is like a comment, like a post-it note on the document, and it is not associated with any part of the text (that’s the popup annotation). I am trusting that poppler has the necessary support for all annotations, otherwise I’ll have to tweak some code there too. My main goal will be to fix this text annotation and extend the support for other types, such as highlighting, underlining and popup. The new gnome has merged two icon themes into one, and now it is called adwaita-icon-theme. If anyone here is new like me, you probably notice that things will no longer compile smoothly with jhbuild.